It’s been awhile cool kids! This is because I haven’t been cooking anything particularly photogenic. Ok I lie, I have been, I’ve just been too lazy to actually photograph ANY of it. Please don’t make me. I did however find the time to finally make these cookies that I promised I would make the day I saw them on i am a food blog. 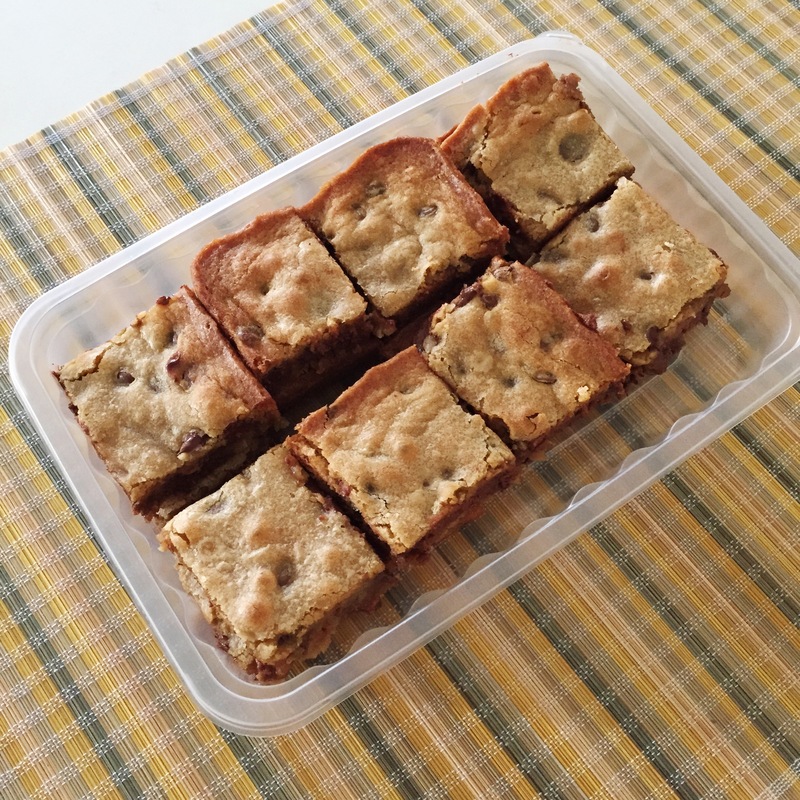 This recipe is unique because it’s sort of a normal chocolate chip cookie but then it’s not because it’s got BLUEBERRIES in it and there’s COCONUT in it and OATMEAL and CHOCOLATE (ofcourseduh) – that I had to make it and see if all these things make it a superior cookie. So I’m gonna level with you. It wasn’t a superior cookie. In fact the blueberries didn’t pop (in the flavor sense) in the way that I thought it would. But guess what? It was a delicious, wholesome cookie, that really hit the spot. It tasted like childhood (at least, white people’s childhoods) and goodness. 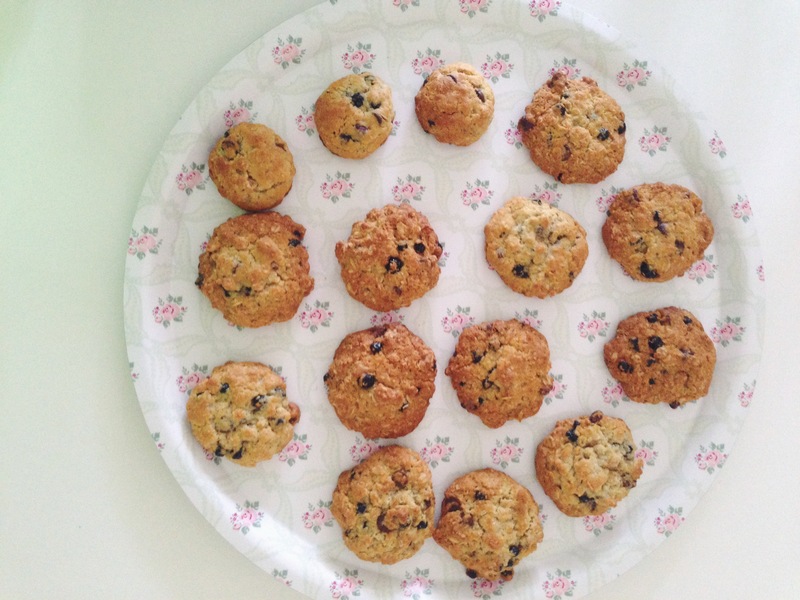 Which is why I would make it again, and swap out the dried blueberries for raisins and white sugar for brown. But see, I would make it again. 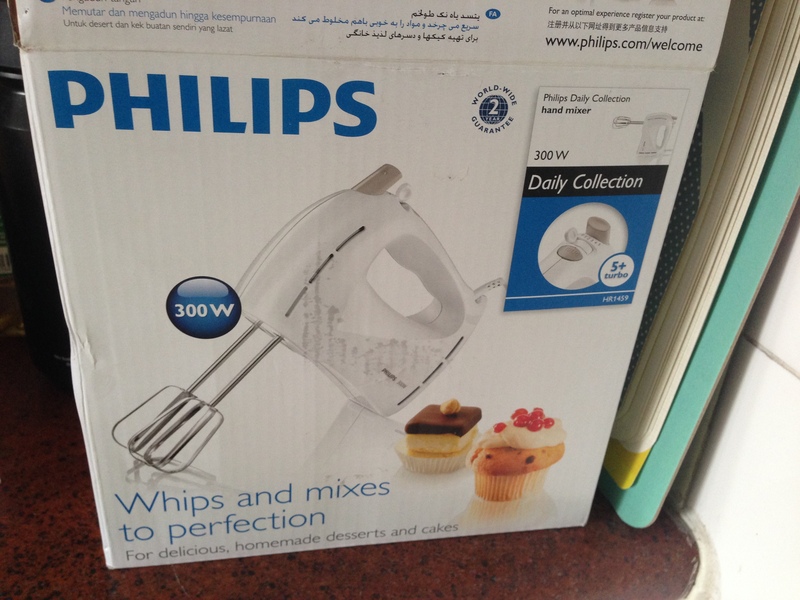 New Mixer from my brother! Preheat the oven to 175C/350F and line a baking sheet with parchment paper. In a large bowl, cream the butter and sugars together until light and fluffy. Add the egg and mix well. Beat in the vanilla. Add the flour mixture to the butter mixture and mix until just incorporated. Add in the rolled oats, coconut, chocolate and blueberries. Stir until combined. Form the dough into small balls and squish them into the shape you want your cookie to be – they will not spread much. Place them on the baking sheet. Make sure they are well spaced. Bake until golden brown about 10 to 12 minutes. Remove from the oven and cool for five minutes before cooling on a wire rack/tray. *Adapted, barely, from i am a food blog. 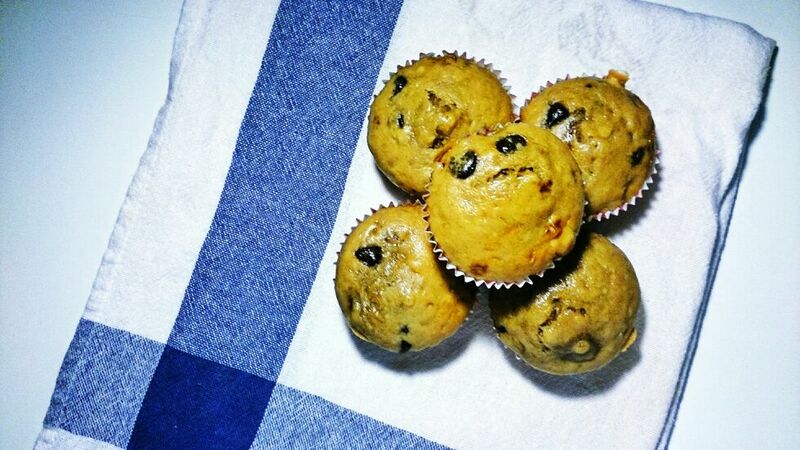 These muffins were almost healthy. They were supposed to be made with whole-wheat flour. But do you know what happens to whole-wheat flour when you leave it in your pantry and then open it months later because you’ve finally found a recipe that calls for it? It becomes a seething mass of weevil infested powder. Doo-doo-doo I’m opening the Lock-Lock container that holds the flour. Oh man, an ant got in. Wait, there are ants all over. WAIT THAT’S A LOT OF ANTS. As you can probably tell I’m a little melodramatic. BUT I’m also a good problem solver. And have been baking long enough to know that hey – just use the white flour Dini. Just use the white flour. And guess what? They turned out great. They are a sticky, banana-based muffin with just enough chocolate chips to keep you happy. Next time I would double the coffee concentration (same amount of water). I can barely taste it with the recipe below. Preheat oven to 175C/350F. Line a 12 cup muffin tin. Combine the oil, buttermilk, mashed banana, coffee, vanilla, maple syrup, sugars and egg. Whisk the wet ingredients together and pour over the dry ingredients. Mix. Bake for 18 to 20 minutes or until a toothpick/skewer inserted comes out clean. *Adapted from The Vanilla Bean Blog. 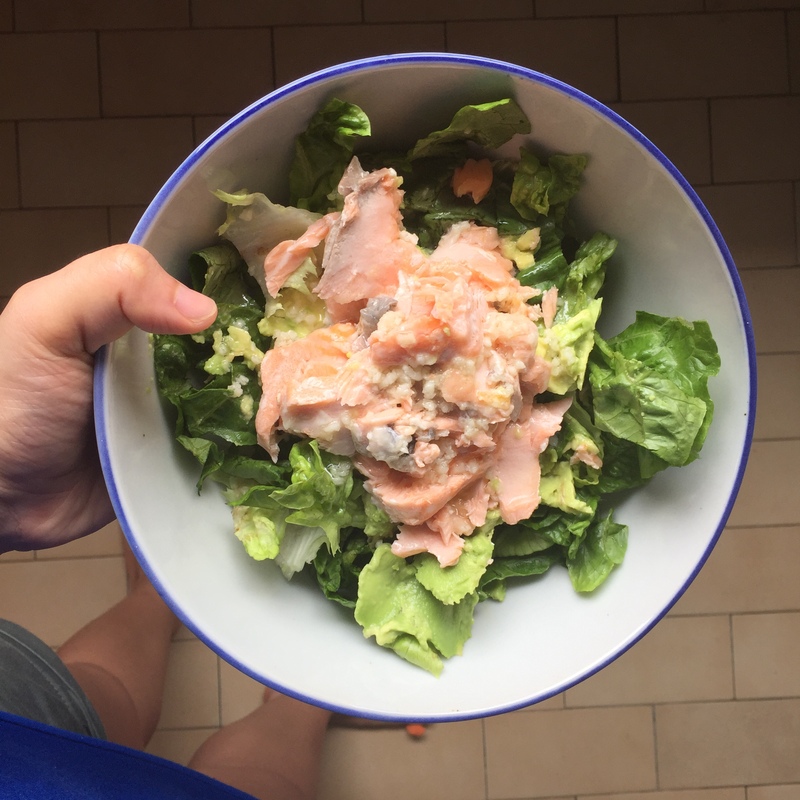 Recently I’ve been on a health kick because BASICALLY I cut off all my hair and I’m terrified of having short hair and being unfit so… I eat salads ALL. THE. TIME. NOW. Except when I’m eating baklava at Overdoughs. Or when I’m baking these squares because I was so inspired by Top With Cinnamon. Sigh. The world is clearly against me. 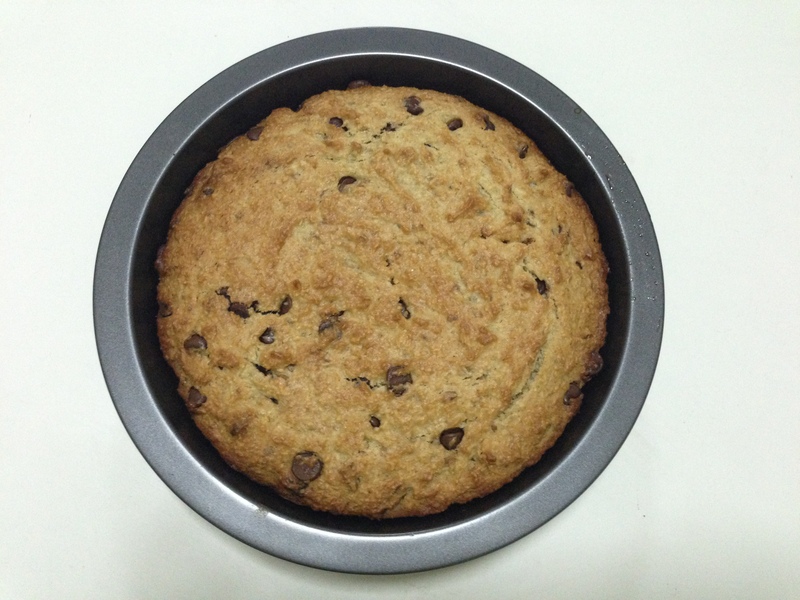 1/3 cup semi-sweet chocolate chipsPreheat oven to 180 C/350 F.Place the butter into a round 8-inch tin put in the oven just till the butter melts. Swirl the melted butter around in the tin to grease it and then pour the butter into a bowl. To the bowl of melted butter, add the sugar, syrup, salt, egg, vanilla and banana. Add the baking soda, flour, and coconut and whisk. Stir in the chocolate chips. 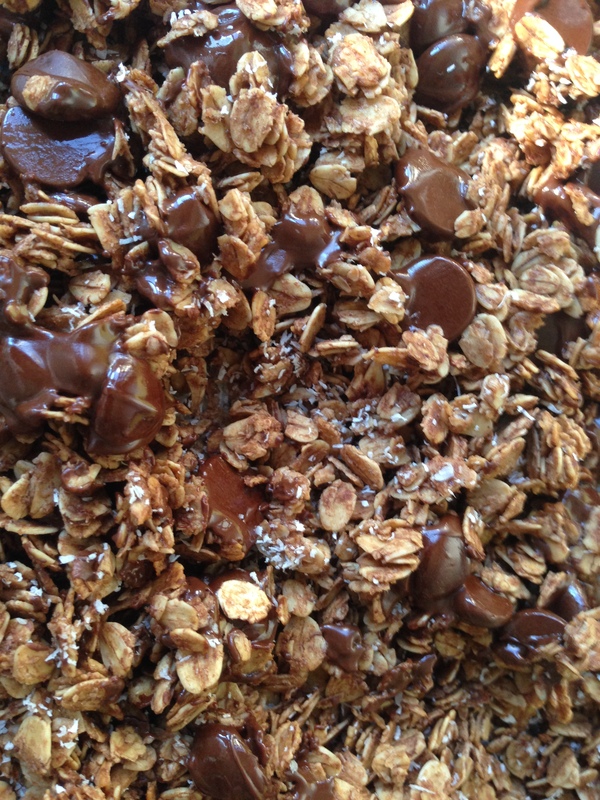 Full disclosure – I added more than 1/3 cup of chocolate chips. Pour the mixture into the greased tin and spread out in an even layer. 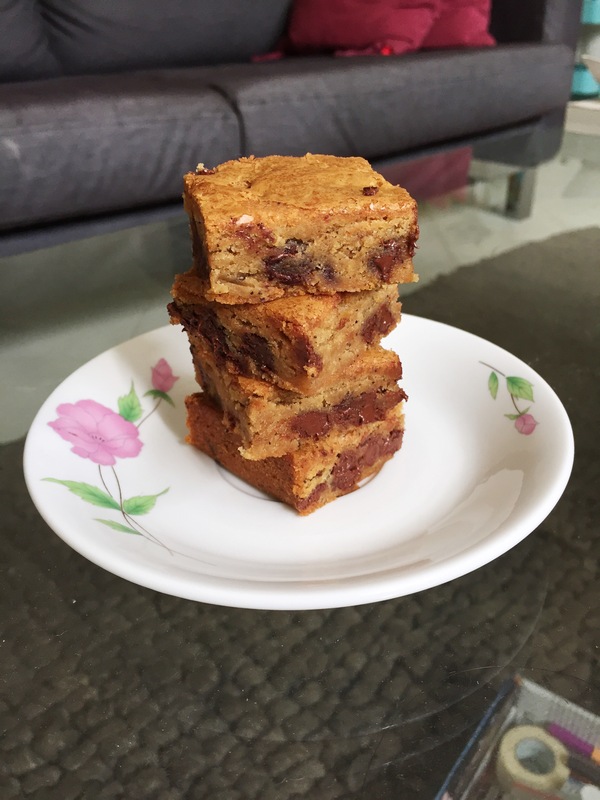 *The original recipe says they are blondies but to me the texture was really like a hearty breakfast bar – hence my renaming! I wanted granola and this is what I had leftover in my fridge/pantry/life. BOOM! Awesomeness in a bowl. Preheat oven to 175 degrees celcius. Line a baking sheet with foil (other people say parchment paper, I don’t have any). In a bowl mix the dry ingredients (oats, cocoa powder, salt and cinnamon). In another bowl mix and then whisk the wet/binding ingredients (coconut oil, maple syrup, light brown sugar, vanilla extract). Pour the wet ingredients over the dry ingredients and stir to combine. I usually use a spoon and then my hands. Pour the mixture onto the baking sheet. Spread it out evenly. Bake for 10 minutes, then remove from the oven and flip and add the coconut. Bake for another 10 minutes. It should smell like it’s done. I know these instructions are subjective. Remove from the oven and when still hot pour chocolate chips over. 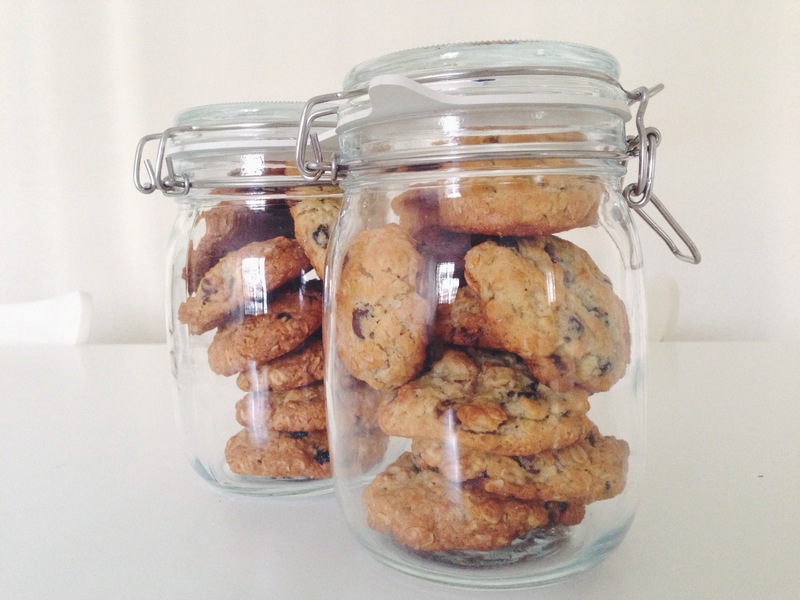 Carefully mix with a spoon so that the chocolate chips melt a bit. Wait until its completely cool before storing in a container. Should keep fresh for a week. 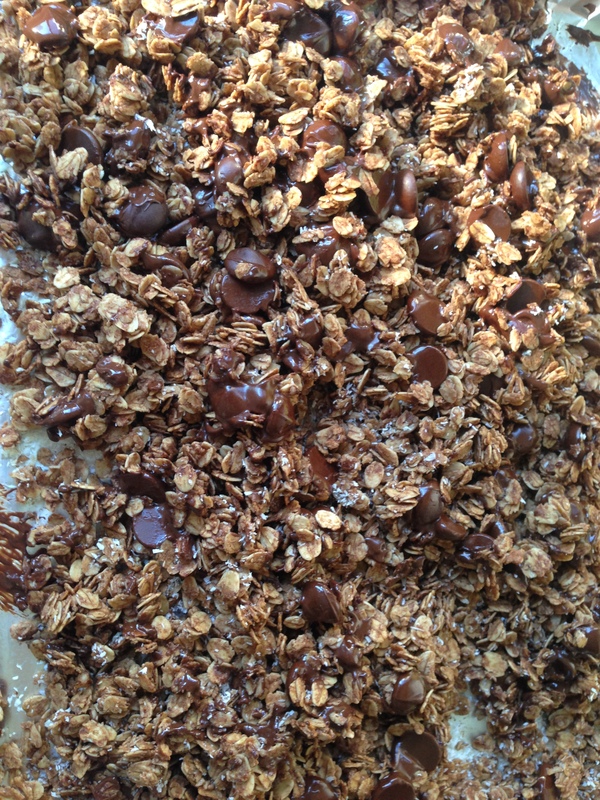 *I owe my granola making prowess entirely to Shutterbean and base my granola recipe on her Nutty Cranberry Granola. 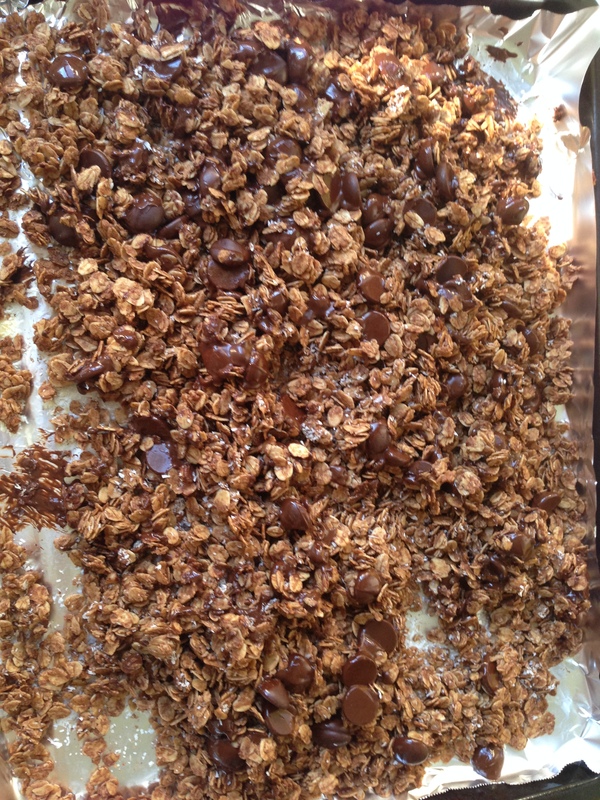 However I did adjust baking times and I find that you really just have to watch the granola and figure out what temperature and time works for your oven. 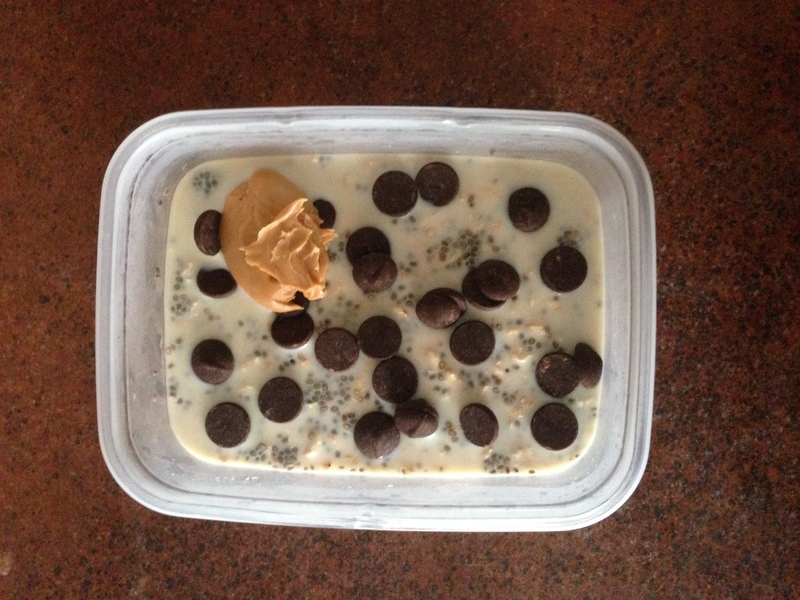 My breakfast this morning (actually this was my breakfast on Wednesday but this is a LIE all food bloggers tell) was this – Chocolate Chip Peanut Butter Overnight Oats. And it was TERRIBLE. This is mainly because I, like an idiot, decided I didn’t need to use a sweetener because HEY the chocolate chips would be enough. They weren’t. But I did use chia seeds and they were pretty kickass and REALLY filling and apparently the INTERNET says its good for me? Ok! Mix oats, milk, chia seeds, honey/maple syrup and vanilla extract the night before. Put in a container (small plastic Tupperware should work) in the fridge. The next morning, stir and top with chocolate chips and peanut butter. * Chia seeds have protein and are awesome and apparently will make you a successful human being. ** My overnight oats are quite liquidy. You can play around with the consistency if you want it less liquidy. I understand that this is obvious advice. But logic may not be your strong point.